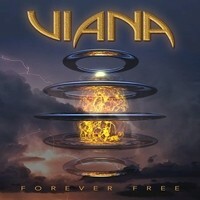 VIANA have masterminded a truly inspiring album with “Forever Free”. This is a AOR/melodic hard rock album that can be spun very often to brighten our days. It is filled with love and passion that is easily infectious. “Forever Free” is an instant winner and is a perfect accompaniment on a cold, harsh day that will have you feeling rejuvenated. Currently, “Forever Free” is out now via Escape Music LTD. Title track “Forever Free” is a perfect opener and gets the party started. Bryan Cole’s vocals are in top form and fits the music perfectly. Stefano Viana also does an outstanding job throughout the album by providing choice riffs. As cliché as it sounds, love is main theme on “Forever Free”. “In the Name of Love” illustrates that love will conquer all, in a non cheesy way of course. Not to mention an awesome chorus to boot. There are some bands that just ooze AOR, and VIANA are no different. However, they very much wear their influences on their sleeve. “Heart of Stone” has a strong Foreigner vibe. Which is a positive because it is nothing but a good time. “Who do You Think You Are” encapsulates VIANA’s recipe for success. Another strong song with a great chorus once again. VIANA are going strong with no filler in sight. Do you ever feel stagnate? Not happy with life? Take a listen to “Live Free or Die” to give your mood a boost. This song will inspire others to live and enjoy life, because gosh darn it, you’re worth it. One of the strongest tracks on “Forever Free” is a ballad. Not just any silly ballad either. “Do You Remember” is absolutely stunning and haunting. Nice choice of piano and amazing vocals. Epic in scale. “Friday Night” is a smart tune to kick off the night, ahem, maybe a Friday night? Total Boston vibes throughout the song also makes this a highlight of “Forever Free”. Sometimes, love can be messy and dirty. Good thing VIANA are in the business of love because “I Wanna Tell You” is another heart warming song. Big Journey vibes at times as well. “We Will Never Say Goodbye” is a grand way to end an album. This is a song that will get stuck in your head. VIANA might have produced the best feel-good album of 2019 with “Forever Free”. Seldom will you listen to a track that is filler or weak, but that doesn’t mean the album is without impurities. There are often times “Forever Free” feels a bit…familiar. Which may not actually be a bad thing. Fans of AOR/melodic hard rock, Foreigner, Journey, and Whitesnake will find a gem here.